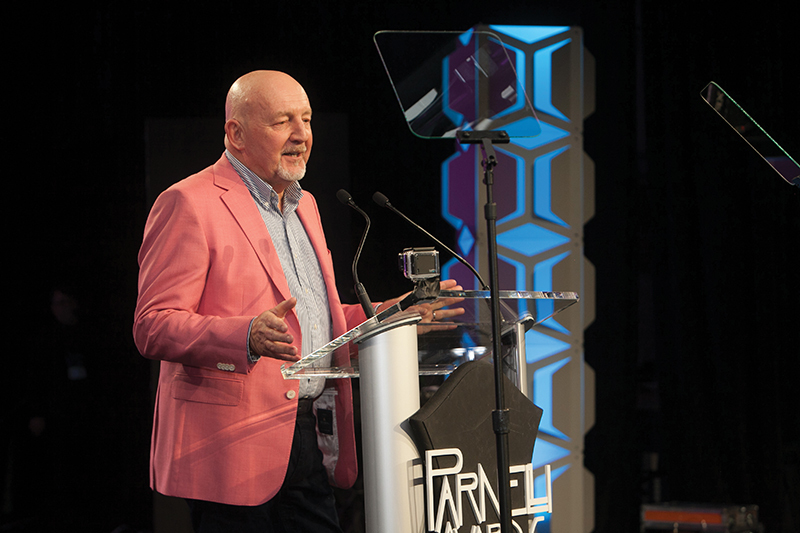 LAS VEGAS — The Parnelli Board of Advisors has announced that Chris Adamson will receive the Parnelli Lifetime Achievement Award at the 18th annual ceremony in Anaheim, CA on Jan. 25, 2019. He’s pictured here at the 2018 ceremony, where he was both an awards presenter and recipient (Tour Manager of the Year). Adamson was born in 1949 in Kingston upon the Hull, Yorkshire, England. As a teenager, he took a five-year apprenticeship at an engineering company where his grandfather had worked. Working mainly on a lathe, he saved up enough money to buy a van. In those days, if you had a van and didn’t play an instrument, you were immediately befriended by someone in a band. For Adamson, that friend was Mick Ronson, who at the time was a guitarist in a band called The Rats (Ronson would go on to play with David Bowie during The Spiders from Mars period). Adamson became something of a commodity, and many local bands began to call on his services. Soon he was earning more for carting their gear around at night than he did in his day job, so he quit and never looked back. He developed a firm friendship with the infamous Dinky Dawson, who was an audio engineer for a blues band fronted by Peter Green. This paved the way to him to work with Fleetwood Mac, something he has continued to do on and off for 40 years. During the late 1960s and early 1970s, Adamson built a reputation for his ability to make rock shows happen, and bands like The Faces and The Herd (which featured a young Peter Frampton) appeared on a list of early gigs alongside ELP and the Byrds. He then landed a “full time” gig with Pink Floyd that lasted approximately 10 years, during which he would see that band become a 24-truck touring act. In the 1980s he worked world tours with Steely Dan, Stevie Wonder and Roxy Music, and in the 1990s, Diana Ross, Michael Bolton, and Lenny Kravitz, among others. Of course there are plenty of stories: Once when working for Frank Sinatra in the 1990s, Sinatra let it be known he wasn’t happy with the cleanliness of his mikestand. The following night Adamson had it spiffed up to be Sinatra worthy. Adamson will receive the Parnelli Lifetime Achievement Award at the Parnelli Awards on Jan. 25 at the Anaheim Hilton during the 2019 NAMM Convention.